Perhaps 3D printing technology makes “seeing and knowing through making” (the transformative principle of contemporary digital culture) literal to the point that the fake, the copy that we can manipulate may acquire more functional, practical, or epistemological value than the original artifact that we cannot touch. Because of its inaccessibility the original artifact might preserve at least a trace (or a shadow) of its “aura,” to use W. Benjamin’s term. Yet, my question is whether in the digital mode of reproduction, also 3D copies are charged with an emotional and cognitive investment that creates a sort of substitutive or surrogate ‘aura’ around them (as Daniel rightly points out in his post “Most of the value [of 3D printing] is explained in psychological terms and the emotional impact of physical objects. It comes up over and over again”). Why do I quote this passage from a white paper about “The Future of the Humanities Ph.D. at Stanford,” mentioned in a very interesting article on today’s NYTimes, “The Repurposed Ph.D”? Not just because Franco Moretti teaches at Stanford but because I believe that Moretti’s book provides some useful indications – on a theoretical level – about a “repurposing of the humanities,” or at least of their “literary studies” branch. Indeed, Graphs, Maps and Trees not only points to a different (or divergent) type of textual data mining and modeling, but also to a different way of training doctoral students in literary studies. The kind of brilliant analyses that Moretti performs in his book in order to demonstrate his theoretical point (“a more rational literary history,” in reaction to close reading as “secularized theology” emanating from New Haven) imply a different (and broader) set of interdisciplinary competences, drawing from quantitative history, geography and evolutionary theory. They also potentially envision broader professional applications beyond the promised (but increasingly elusive) destination of tenure-track professorships. Perhaps, as the NYTimes article also suggest, such a repurposing of the (digital) humanities can help form a new generation of culture analysts with a new set of skills which can better prepare them for “jobs within universities but outside the professoriate, like administrator or librarian, as well as nonacademic roles like government-employed historian and museum curator,” and can even help them move across the job market, from higher education to industry, governmental institutions, foundations, etc. 2. Quantitative data demand an interpretation that transcends the quantitative realm. 3. Quantitative data can falsify existing theoretical explanations (for example, interpretive assumptions about the history of the novel). Moretti distinguishes between graphs, that are not really models, and maps and (especially) evolutionary trees that, instead, are such models, that is “simplified, intuitive versions of a theoretical structure.” (p. 8). We can discuss in class the difference between these forms of visualization and their particular usefulness for our specific research goals. Graphs allow Moretti to formulate and/or falsify hypotheses about the system of novelistic genres as a whole (the life cycles of genres and subgenres). Maps are a good way to prepare an individual text (from the “village stories” series, for example) for analysis: by placing a story in space, the map offers a model of the narrative universe that, compared to other maps in the series, can bring some hidden textual patterns to the surface (“the road from birth to death of a specific chronotope”). The map becomes a diagram. Diagrams look like maps, yet they represent relations not their distribution in space, “a matrix of relations, not a cluster of individual locations.” (GMT, p. 54) Diagramming the use of the free indirect discourse or the use of “clues” in detective fiction allows Moretti to make macro-morphological divergences appear: “this system of differences at the microscopic level [the sentence] adds up to something that is much larger than any individual text, and which in our case is of course the genre – or the tree – of detective fiction” (GMT, p. 76). As Matt Kirschenbaum writes in his contribution to Reading Graphs, Maps, Trees, a volume which collects critical responses to Moretti’s book and Moretti’s own replies to his critics, “the goal of data-mining (including text-mining) is to produce new knowledge by exposing unanticipated similarities or differences, clustering or dispersal, co-occurrence and trends.” The key word, here, is “unanticipated.” Visualization tools allow us to see/make this new knowledge emerge (graphs, maps and trees “place the literary field literally in front of our eyes – and show how little we still know about it…” – as Moretti effectively puts it). I think the ambiguity of “seeing/making” touches upon one of the crucial questions we have debated, in relation to most of the tools we have considered: visualizations are (computational) artifacts that may give us the illusion of “discovering” what we are actually “configuring” through our tools. Viceversa, they can help us find unanticipated patterns, and formulate interpretive hypotheses in controlled exploratory experiments with our data models. This, by the way, is what Moretti does best. In conclusion, distant reading seems several steps removed from close reading: it deals with data models (and forms of visualization, or interfaces) that extract and represent abstract patterns from textual data, “translating the traditional way of formulating critical problems in the humanities into reasoning that can be tested, algorithms that can be run” (Matt Kirschenbaum). Yet, Moretti seems to suggest that a successful and meaningful application of his theory should allow the critic to make discoveries valid also at the microtextual level. Ultimately, if “theories are nets” (as Moretti states, quoting Novalis), we must “evaluate them not as ends in themselves, but for how they concretely change the way we work,” and perhaps also for how they help us humanists find new purposes for our research. Adding Complexity by Keeping It Simple? from: The Dialogic Imagination: Four Essays by M.M. Bakhtin, translated by Caryl Emerson & Michael Holquist, University of Texas Press, 1981. Another definition by Anthropologist James Clifford: “The chronotope is a fictional setting where historically specific relations of power become visible and certain stories can ‘take place’ (the bourgeois salon in nineteenth-century social novels, the merchant ship in Conrad’s tales of adventure and empire).” Examples of contemporary chronotopes: the border, the green zone (gated community), the strip mall, the detention center. To assign chronologies and timelines an “explanatory” value is a fallacy, if we take “explanation” in the nomothetic sense, as the expression of a rule or law. In other words, timelines do not prove anything and do not explain the phenomena they represent or order (according to a chosen narrative thread or interpretive principle, or “spatial instantiations of history”). Or do they? Can we say, for example, without falling prey to a “deterministic” prejudice, that chronologies and timelines are intuitive tools that allow us in the humanities to visually grasp the elusive temporal nature of (human) life and culture – what we call “history”? By translating time into a spatial representation, visualizations help us understand, or better intuit, time as a perceivable and measurable entity. As a historiographical tool, Cartographies of Time shows how chronologies and timelines are based on specific cultural assumptions and categories and are often conditioned by the technical means of reproduction and visualization at our disposal. Can we say that the difference between an equation and a poem is that the first tries to prove the intuition and the second simply put it in words…or images? And yet we continue to use (mostly linear or sequential) chronologies as “explanatory” tools (if only in a hermeneutically lighter sense, as a “weak” but useful “explanation”). Of course, there are timelines and timelines: a geological periodization of earth’s history is not the same as a paleontological or an anthropological, art historical or literary historical one, etc. The very notion of “time” varies greatly across disciplines… Perhaps multiple overlapping timelines, by showing the differential relationships and gaps between temporal series, can help us put in perspective our periodization tools. What I find interesting here is that a new vision technology help us visualize and intuit the multidimensional, multi-scale, “deep” relativistic nature of our scientific representations of “time.” (Although a critic could easily note that certain assumptions about the linearity ot time persist and are embedded also in this tool). Nevertheless, visualizing multiple timelines at once (or zooming in and out from one to the other) can allow us to see how time is conceptualized (as a function or a variable), across the disciplinary spectrum…Thus the timeline can become a sort of self-reflective interdisciplinary tool: it doesn’t necessarily prove anything but definitely helps our intuition(s). Or does it? Massimo Riva: Translational or Generative? Or both? It may be worth asking whether we consider the DH as a set of non-traditional, computational tools that are useful for humanists in the pursuit of their traditional scholarly goals, in both research and pedagogy, or an entirely new paradigm for knowledge work in the humanities, which transforms not just methods and techniques of inquiry and interpretation but the very nature of humanistic inquiry and interpretation. To put it in a slightly different way: do DH simply apply computational techniques to traditional data sets, or transform the very nature of the data we humanists consider in our investigative and interpretive practices? This transformation is often seen in parallel to the advent of a “fourth paradigm” in human knowledge: data-intensive scientific discovery (http://research.microsoft.com/en-us/collaboration/fourthparadigm/4th_paradigm_book_complete_lr.pdf). 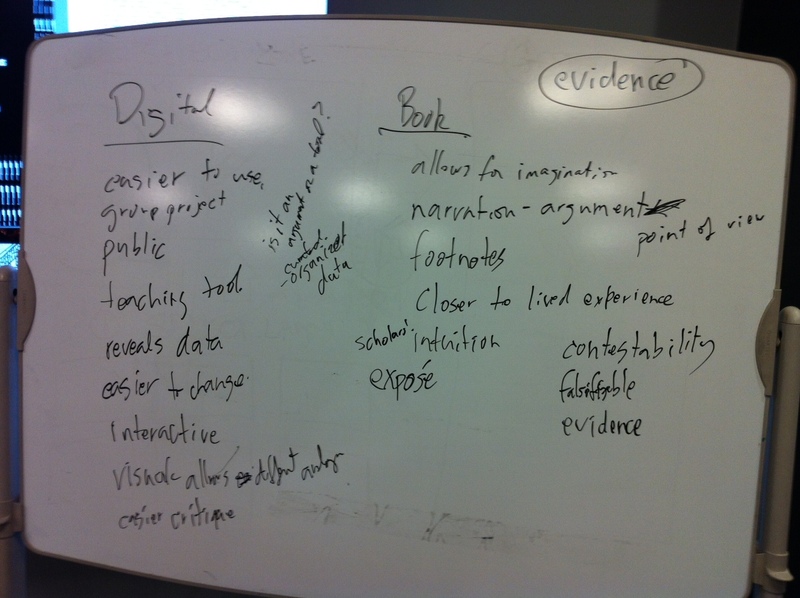 These two views of DH can be characterized respectively as the “translational” and the “transformative” view. Is DH just a translation onto the digital platform of values, methods and procedures largely shaped in a pre-digital world? Or is DH an entirely new form of generative knowing, which actively shapes new cognitive values (perhaps more compatible with those of the social and biological sciences) along with new methods of inquiry? According to the translational view, digital tools must translate on to the digital platform proven, pre-digital philological and historical techniques and methodologies, and integrate them with computational procedures. Data curation is first and foremost data preservation, which includes also the preservation of pre-digital cognitive and interpretive modes and frames embedded in pre-digital, analog documents and artifacts. Example: Text encoding. 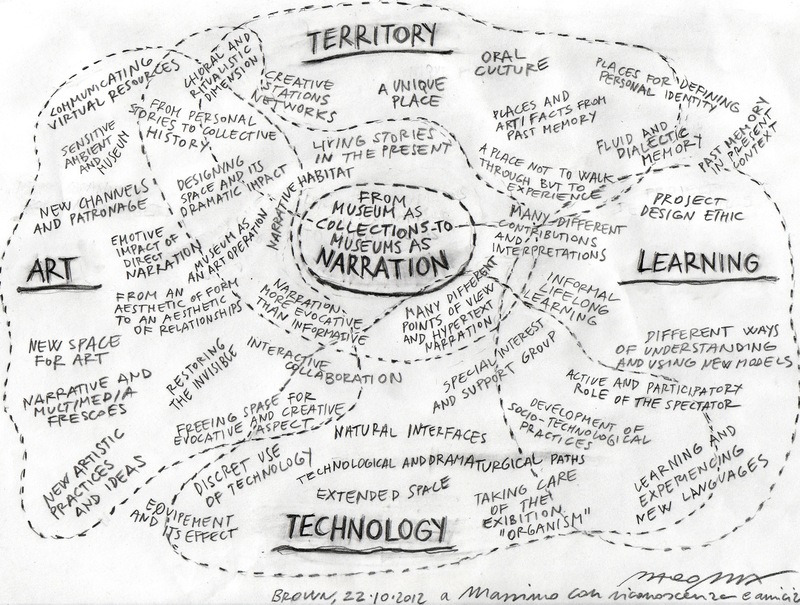 According to the transformative view, instead, “the advent of Digital Humanities implies a reinterpretation of the humanities as a generative enterprise: one in which students and faculty alike are making things as they study and perform research, generating not just texts (in the form of analysis, commentary, narration, critique) but also images, interactions, cross-media corpora, software, and platforms” (Burdick & Others, Digital_Humanities). This translates into newly conceived data sets and models for the humanities. It is worth noting that the generative conception of the DH adopts a scientific-technological model that is rapidly becoming dominant or hegemonic in our culture. As Evelyn Fox Keller (Professor Emerita of the History and Philosophy of Science, a historian of biology at MIT) wrote ten years ago in her book, Making Sense of Life, (Cambridge, Harvard University Press, 2002, p. 203): we “live and work in a world in which what counts as an explanation has become more and more difficult to distinguish from what count as a recipe for construction.” The gulf between understanding (as the primary cognitive mode for the ideographic humanities) and explaining (as the primary cognitive mode for the nomothetic sciences) is widening: or is it? Fox Keller argues that also the nature of explanation is changing in the age of data-intensive scientific discovery. This seems also the cognitive attitude reflected in this quote from Trevor Owens’ “Defining Data for Humanists”: “as constructed things, data are a species of artifact” (Zoe also picked up on this quote in her post). A similar point is made by Tara Zepel who sees Visualization as a self-standing (sub) discipline within the DH: “Visualization is an entire framework for building, communicating, and most importantly experiencing knowledge.” And even more radically this point of view is advocated by the Manifesto: “The theory after Theory is anchored in MAKING.” A constructivist ethos is clearly pervading the DH. In conclusion, data modeling in the DH is indeed “transformative” – new types of data and data sets are assembled and analyzed thanks to computational techniques; but it must also be “translational” – adapting interpretive practices typical of the humanities and their various disciplinary fields to the new objects (artifacts) of inquiry. A perfect compromise? The Density Design Sets, see in particular: Brain Houses as an example of transformative panoramic view (based on a visual genre or genres, but innovative and “transformative” in their interpretive application).